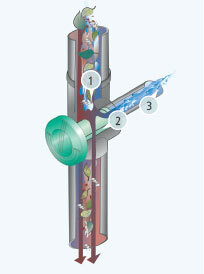 The 3P Filter Collector filters and collects rainwater for water butts and rain tanks. It is made of high quality durable plastic. With 2 positions open or closed. Integrated filter sieve. The mesh is made of stainless steel (mesh size 0,7 x 1,7 mm). For roof areas up to 70 m². 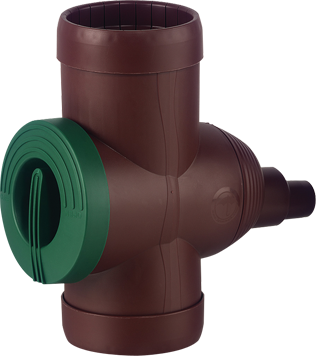 For installation in downpipes at 68 mm and 110 mm, adapters included. Complete with adapter and reduction sets. 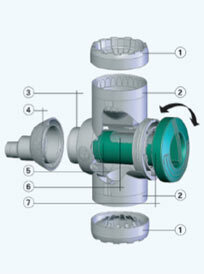 Rainwater is channelled from the filter entrance to the sieve cartridge. Dirt is rinsed to the sides, and to waste. Cleaned water is led through the cartridge outlet channel to storage. Settings for winter and summer conditions. Twist 180° to remove cartridge filter, no need to demount filter body. The filter cartridge can be cleaned easily with detergent and a brush. Reduction at Ø 68 - 100 mm. 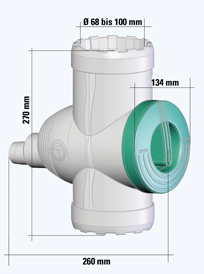 Connector for downpipes Ø 110 mm. Outlet connection at Ø 75 mm. Adapter for connection Ø 50 mm/32 mm. Assembly in standpipes or downpipes at Ø68 - 110 mm. 3P Filter Collector brown with adapter, here connected directly with the 3P Rainwater Tank with a capacity of 300 l.
3P Filter Collector grey without adapter, here connected directly with the 3P Rainwater Tank with a capacity of 500 l.
3P Filter Collector grey connected with a Feature Water Tank.